If you could find a bathtub big enough, Saturn would float in it. Some of Saturn's moons control the width of its rings. These are known as shepherd moons. Although it is made of gases, Saturn may have a small rocky core. Saturn is 120,536 km or 9.449 Earths wide at the equator. Saturn is mostly gas and liquid. Saturn may have a small core of rock and ice. The atmosphere has bands, but they are not as colorful as Jupiter's. Saturn's rings are composed of rock and ice particles ranging in size from specks of dust to the size of a house. Some particles might even be a few kilometers wide! The particles in the rings are actually spaced far apart. It would be easy to pass through the rings. Saturn has 34 moons with names. The size of Saturn's moons and the size the chunks of ice in its rings are similar. This means that we can never know the exact number of moons. So far, 48 moons have been discovered. New moons are still being discovered. There are small potato-shaped moons in or near Saturn's rings. They control the ring particles with their gravity. That is why they are called shepherd moons. Six of them are known and there may be more. Mimas is made mostly of water ice with a little rock. It has a large crater for its size called Herschel. It is 130 km across, making it about a third as big as Mimas. The crater makes Mimas look like the Death Star from the Star Wars movies. Enceladus is made of ice. It is denser than other icy moons. That suggests it also has some rock inside. It has smooth areas, cracks and some craters. The smooth areas are younger. Craters there have been erased within the past 100 million years. Water vapor was found over a smooth area around the south pole. The cracks and grooves suggest tectonics similar to Ganymede's. Some ridges similar to Europa's ridges were also found. Those suggest oceans like Europa's under some areas of Enceladus.Tidal forces from Dione could be powering some of this activity. It is because Enceladus orbits Saturn twice for every orbit by Dione. This makes Dione and Saturn tug on Enceladus. This is similar to how Europa and Ganymede's tidal forces on Io power Io's volcanoes. Tethys is an icy moon that has many craters, including the huge Odysseus. It is 400 km across, 1/5th as big as Tethys is. The crater had become flattened because the icy material does not hold its shape as well as rock would. There is also a large valley called Ithaca Chasma. It is 3 to 5 km deep, 100 km wide and 2000 km long, three fourth of the way around Tethys. There are two moons, Telesto and Calypso, which share Tethys' orbit. Telesto is ahead of Tethys and Calypso is behind it. Dione is made of lots of ice and maybe some rock in the core. It has lots of craters. The craters are flattened because the ice does not hold their shape as well as rock. One side has bright white lines that are fractures. Two moons share Dione's orbit. Helene is ahead of Dione and Polydeuces is behind it. Rhea is an icy moon similar to Dione with some rock in the core. It has many craters on one side and the other side has some bright white icy areas. Titan is the largest moon of Saturn and the second largest one in the solar system. It is the only moon in the Solar System that has a thick atmosphere. The atmosphere is made of nitrogen, argon, methane and various organic compounds. Its surface has light and dark areas and few craters. However, the Cassini probe discovered a huge crater 440 km wide. Hyperion is made of water ice with a little rock. It is potato shaped. It wobbles instead of rotating in the same way other moons do. Iapetus is almost entirely ice. It has a light area called Roncevaux Terra that has craters. There is a big dark area called Cassini Regio that covers half of Iapetus. The dark material may be from Phoebe. Some of it is on the bottom of craters. Some huge craters and a ridge had been discovered in Cassini Regio by the Cassini probe. The ridge stretches 1300 km along the equator. It is up to 20 km high, which is over 20 times higher than Mount Everest. Phoebe is made of ice and rock. It looks dark because it has a layer of dark material on the outside. It also looks rough. There are two groups of small outer moons. Phoebe is part of the second outermost group. One day on Saturn is about 10 hours and 42 minutes in Earth time. One year on Saturn is about 29.46 Earth years long. That is 10,760 Earth days! Saturn has a rocky core. Around the core, there is ice. Above the ice is liquid metallic hydrogen. On top of that is gaseous hydrogen. There is no place where the hydrogen suddenly turns from a gas to a liquid. The gaseous hydrogen makes up most of Saturn's atmosphere. Other gases there include helium and some other gases. There may be rain made of helium falling through the hydrogen. How much would Saturn's gravity pull on me? If you were floating close to the cloud tops of Saturn, it would pull you down with a force only a little stronger than the force of Earth's gravity. The effects of Saturn's large radius and its mass almost cancel out, making the force only a little bigger. If you weighed 100 pounds on Earth you would weight about 106 pounds on Saturn. Saturn is named after the Roman god of agriculture. He taught people how to farm. He was the father of Jupiter. Saturday is named after him. 1) How long is one year on Saturn? 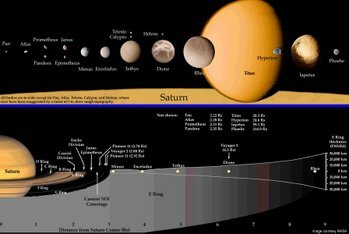 2) How long is a day on Saturn? 3) If you weighed 100 pounds on Earth, how much would you weigh on Saturn? 1. Saturn is so large, yet its gravitational pull is similar to earth. Why is this? 2. What is the surface of Saturn like? 3. Which statement is not true about Saturn? c) hydrogen gas makes up most of Saturn's atmosphere. 5. Who is Saturn named after? a) Saturn is named after the Roman god of agriculture.